Keokuk rose to power among the Sauk and Fox tribe along the Rock River on the Illinois-Iowa border. 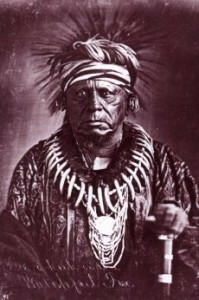 He opposed leaders such as Black Hawk, who urged militant resistance to white incursions into tribal lands and instead counseled accommodation with and concession to the government. As a result, the Sauk and Fox homelands were ceded to the United States and Keokuk grew wealthy, but lived in disgrace among his tribe.